Regardless of your take on the role of cannabis in society, the numbers are conclusive – the cannabis industry is one of the fastest growing sectors in the last 250 years of the US (and global!) economy. Often referred to as the “Green Rush”, investing in cannabis conjures up images of the gold rush and the wave of investor enthusiasm plus entrepreneurial effort that defined much of the western expansion of the United States. But just like the gold rush, investing in today’s cannabis industry is fraught with many perils. First and foremost, there are obvious challenges with fraudulent or unethical players that carry over from the industry’s black market roots. As the industry matures, and regulatory compliance takes hold, those bad apples are continually culled from the pack leaving more honest, integrous companies that are genuinely working hard to create value for their customers and their shareholders. Unworthy & “not real” businesses aside, cannabis investors continually struggle to find their perfect deals. Even with so many honest, hard-working, worthwhile startups, investors find it challenging or near impossible to generate a deal-flow pipeline that is aligned with their investment strategy and will yield meaningful returns within their portfolio. 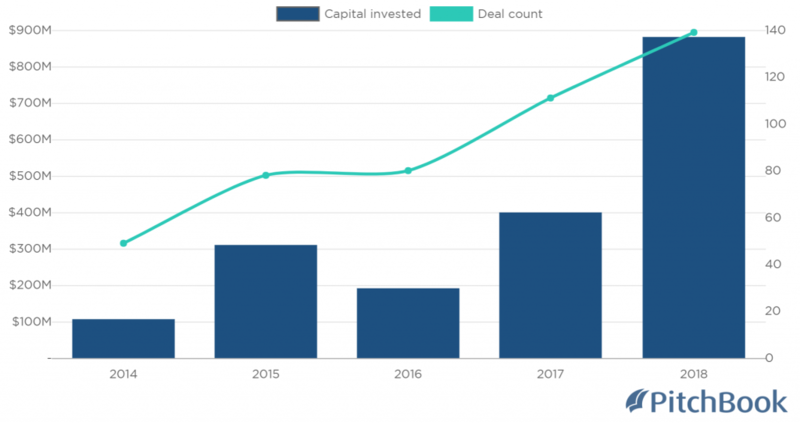 According to Pitchbook, deal flow in 2018 more than doubled that of 2017 – that’s incredible growth! As the size and scope of opportunities increase, cannabis investors spend accelerating amounts of time and energy talking to and qualifying potential deals, only to realize much too late in the process that this company is not a good fit for the investor’s strategy. Worse still, sometimes investors don’t realize the deal is a dud until after deploying capital, resulting in direct losses on their balance sheet. On the flip side, entrepreneurs and business owners spend inordinate amounts of time, energy, and money chasing investors that are not aligned with their business type, vision, or goals. Sometimes these misaligned discussions are the result of bad actor investors that are maliciously scraping business models for their own unethical purposes. More often than not, especially in the cannabis industry, these dead-end dialogues are the result of investors who simply do not know, or have not taken the time to define, their investor thesis and how that maps to the current conversation. No one, neither investors nor businesses, wants to waste their precious resources on deals and discussions that will go nowhere. More importantly, these wasted resources result in overall market friction that reduces the rate and acceleration of industry growth as well as investor return on investment (ROI). Double whammy! Call us obsessed, but we see empowering data as a simple and efficient solution to this entrenched and pervasive market problem. Read more below, or skip ahead and click here to create your data-driven investor thesis. 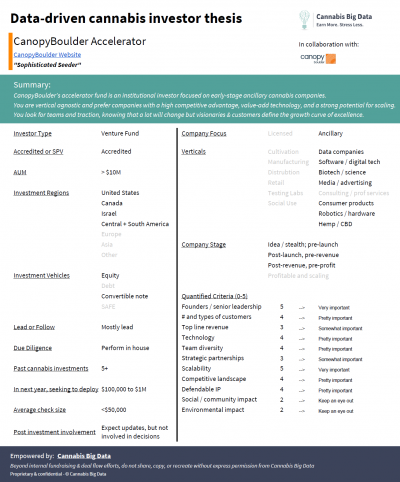 (Entrepreneurs, you can create your data-driven business profile here). From our first-hand experience raising capital, as well as second-hand experience talking to investors as well as entrepreneurs, one of the biggest challenges is to quickly and efficiently identify whether a company (or investor) matches your industry focus, core values, and business objectives. Beyond these foundational considerations, the next round of challenges revolves around product-market fit, growth potential, and deal terms. Step 4) We use a data-driven algorithm to define compatibility as well as a match score. The higher the score, the higher the potential this deal is a good fit for you and your team! 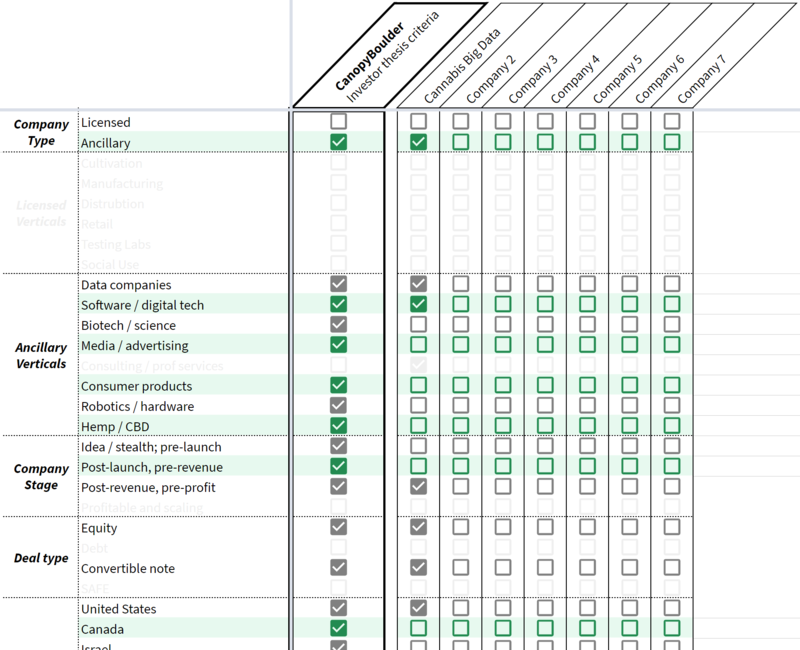 In short, this data-driven toolkit empowers cannabis investors to define their investor thesis and focus on the companies that make the most sense for their specific worldview. So in less time than it takes to drink a cup of coffee or tea, investors & entrepreneurs can save dozens of hours of wasted time and energy chasing dead-end deals. Whew, what a sigh of relief! For entrepreneurs, that means more time and mind space to focus on their product and their customers. For investors, that means more time for due diligence on the highest value deals, and ultimately higher returns from investing in stronger, more aligned companies. For the industry, that means less friction in the capital markets and happier humans doing more meaningful work and with more time to care for themselves and their families. What’s not to like?! 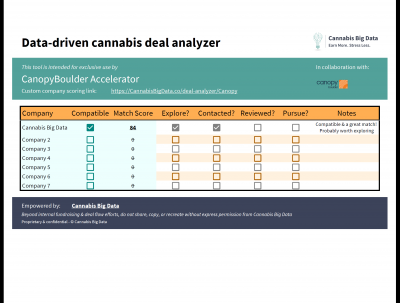 Beyond the immediate and impactful value of a data-driven investor thesis to save time, energy, and money for both investors and businesses, there is also a long-term impact and benefit to cannabis capital bearers. 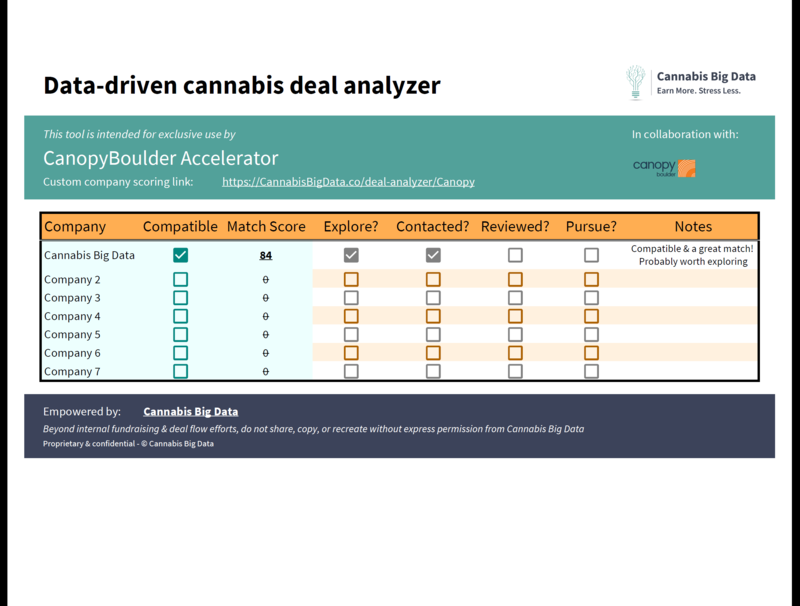 Over time, cannabis investors can run historical correlative analyses identifying the core considerations that are most likely to impact success and, most importantly, returns on investment. In our lexicon, this is a machine learning protocol and predictive model with historical data-driven deal assessments as a training dataset. In plain English, this is a computer algorithm that looks back in time, figures out what worked and what didn’t work, and applies those lessons learned to the matching score for future potential deals. Armed with this depth of analysis and insight, fund managers can then turn around and use the same methodology to qualify, nurture, and close their own funding sources. 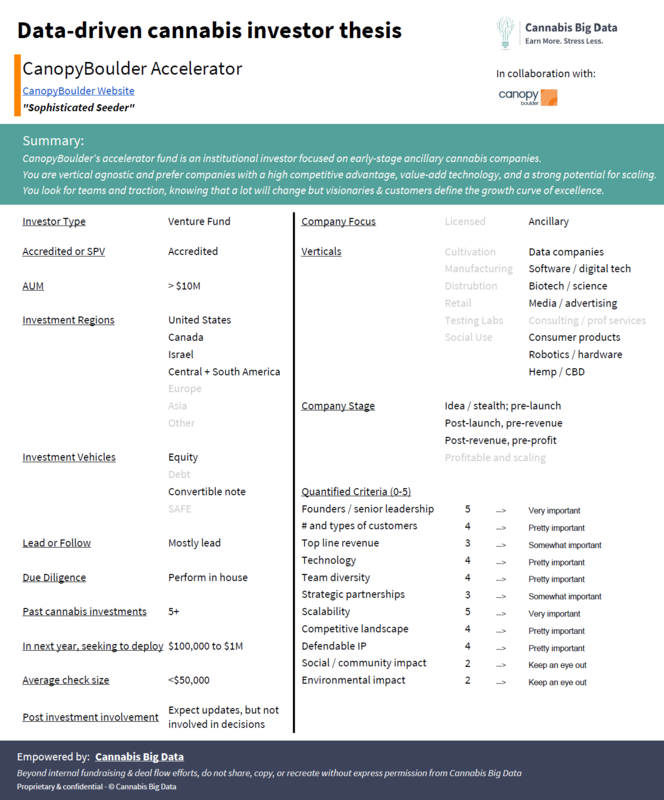 In addition to incorporating their portfolio analysis into their fundraising pitches, investors can reach out to limited partners (LPs) with a similar survey and workflow to validate that they are a good fit for this particular portfolio thesis. Overall, there is no question that data-driven investors (much like data-driven companies) will quickly dominate the market. In addition to saving investors time, energy, and money in the short-term, the data toolkit will also get smarter over time to continue to pick the best bets that yield the highest returns in the long-term. Lastly, data-driven investors will save time and energy as they are sourcing additional investment for current or future fundraising rounds. Because this data-driven investor thesis tool has tremendous value for everyone in the market, including our company, we are offering this resource under a forever free model. Our core value #1 is “Care Hard” and core value #2 is “Respect Everyone”, so needless to say we care hard about this industry and the people in it. We hope this tool makes your day that much brighter because, if nothing else, we care hard about your challenges and deeply respect your time. As always, we warmly welcome your feedback on our contact page or by emailing [email protected]. Do you have a clear idea of your current challenges and opportunities? Do you need help figuring out how best to clean up your data? We always love to hear from you on our contact page and are happy to give you an unbiased perspective on who will best serve your needs. If you’d like to chat about your specific business and needs, feel free to schedule a free data consultation. We firmly believe that a rising tide lifts all boats, and if we can help you (and our data peers) succeed in this rapidly growing market, it is our honor and pleasure to do so.